You are currently browsing the archives for the Auto Barrier category. A pet car barrier to keep your dog from distracting the driver. Traveling in a pet crate or dog seat belt would be safer for your best friend. But some dogs just don’t like riding in them. We advise training them to get used to it, but we understand that is not always so easy. And sometimes you just need a short term solution until you can get them used to it. That’s where a dog car gate can come in handy. The best safety feature of pet car barriers is that they can help keep your dog from being a distraction to the driver. Your dog can no longer stand on the center console. And a dog car gate will deter your dog from trying to climb over and into your lap. Pet car barriers may provide some protection in a car accident. With a dog car gate in place, your dog won’t fly to the front seat and hit you or crash into the windshield. A metal dog car barrier. We have three different kinds of pet car barriers. There is a metal dog car gate. This tends to have the most coverage, but they are installed with pressure mounts which may leave indentations on the ceiling and floor. Small dogs may be able to get through the bar gates. And the wire mesh gate is not a universal fit so there may still be some gaps for your dog to go through on the sides. The next type of divider we have is called The Pet Net Brand. It is durable yet flexible, which means if your dog flies forward into it, the pet net will absorb some of the impact. But this divider does not go all the way to the top or the sides. So a determined dog might be able to climb over it or find a way over on the sides. My Maya behind the Outward Hound pet car barrier. The third type of divider is the cloth dividers. This is the simplest, and oftentimes the least expensive, of the pet car barriers to install. They only cover the center console area, though. So a determined dog can climb over it, just like with the pet nets. If your dog doesn’t like riding in the pet crate or hates wearing a dog seat belt, consider one of the three different kinds of pet car barriers. 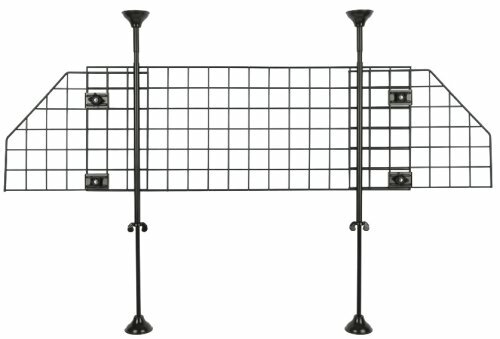 A metal dog car gate generally works best in SUVs while the pet net and cloth dividers will work in both cars and SUVs. The metal ones generally work best for larger dogs while the net and cloth ones are better at keeping smaller dogs in the back seat. Take the size and the temperament of your best friend into account. Think about which product would work best for your vehicle. And, as always, have happy and safe travels. Sadie behind the BreezeGuard Window Screen. Many people like to take their pets with them when they travel. But what will you do with your dog when you have to go inside a building, such as a grocery store, where he does not belong? You may have to leave him in the car. Leaving a dog along in the car is unsafe for two major reasons. First, the car heats up quickly even if it is not hot outside and the windows are down. Second, someone could steal your dog. When people see our Breeze Guard Window Screens, they hope that they have found the solution to these two major problems. However, this is a common misconception. “Thank you for contacting us regarding the Breeze Guard Window Screens. The pieces fitting around the door frame are strong velcro-like pieces. They are much more durable than regular velcro. Someone could cut the straps but it wouldn’t be any more difficult or easier than jimmying the car open or breaking a window. Non-professional criminals are looking for an easy-in such as an unlocked door while more professional criminals have the same tools for unlocking car doors as tow truck drivers or lock smiths. Because of these criminals it is never safe to leave your valuables, especially your pet, in the car. “The Breeze Guard Window Screens are not intended to be theft guards. They are intended to keep your dog from putting his head out of the window and getting hit by flying road debris, from jumping out the window while the car is in motion, or from accidentally getting tossed out the window in the event of a car accident or emergency car maneuver. Another thing we could have replied to this customer was that even with the Breeze Guard Window Screens, the car can still get very hot inside. Leaving the windows down in your car can alleviate the heat a little bit, but it is no substitute for air conditioning or a nice fast breeze coming through an open window when the car is in motion. The hyper dog generally loves to ride in the car. He wants to be everywhere at once. This is how my dog Maya is in the car. For her, I have her wear a dog seatbelt. Her dog seatbelt has the strap extended so that she has some mobility. The strap isn’t long enough to allow her to get in the front seat, but it is long enough for her to reach one of the windows. I also have the Extend-A-Seat to cover the floor so that she has more room to move around and there is no danger of her getting thrown onto the floor in a sudden stop. For the hyper dog you can also try a pet car barrier. As stressed in the previous post, be careful because a determined dog may be able to circumvent a pet car barrier. You may also be able to help a hyper dog by not just taking him to fun places like the dog park, but also taking him to boring places like the bank drive through. Or just drive around the block and come back home. Perhaps if your dog isn’t always going somewhere fun when he is in the car, he may become desensitized by car rides. A good example of how desensitization works would be if you got out your dog’s leash often throughout the day but didn’t take him for a walk. He would eventually realize that the leash does not mean getting to go for a walk. Pet travel safety is important. But so is your dog’s comfort. Working with your dog by helping him be desensitized to car rides or helping him not be so anxious in the car can provide him with both comfort and safety. Pet travel safety is provided by your dog not being a distraction to the driver. A dog seatbelt, a car seat for dogs, or a pet car barrier can also help with both comfort and safety.